Luigi Mozzani was a famous and respected guitarist who died in 1943. He also made guitars and travelled widely, living in England for 6 months. His most famous work is “Feste Lariane” the favourite of many an aspiring concert guitarist. He lived in Bologna, which is where he had a large library of music in which Angel Gilardino found a neatly written manuscript of a solo guitar piece which was signed “Respighi” at both top and bottom. 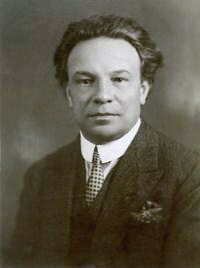 The one and the same person who wrote three orchestral suites called Antiche arid e danze per liuto in 1917, 1923 and 1931.